http://www.galerija-makek.com/makek/index/index/tra/50100/l/en Makek gallery was founded in 2006. in Zagreb. It is situated in an attractive location in the area called Lenucije's horseshoe, on Zrinjevac, where the leading cultural and artistic institutions found their habitus: the Archaeological Museum, Strossmayer's gallery, Gallery of Modern Art, Art Pavilion, ... Forerunner of Gallery Makek is Gallery Paradiso which was founded in 2000. on island of Rab Collection of galleries containis the impressive number of works of art - paintings, drawings, prints, art photography and sculpture by renowned, mostly academicly educated Croatian and European artists. The aim of the Gallery Makek is the introduction and the presentation of modern and contemporary Croatian and European art through constant display, but also through exhibitions of independent authors and groups of artists defined by thematic or stylistic link. 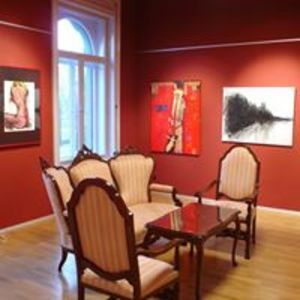 Galerija Makek has a vast collection of art works from near two hundred croatian and international autors. You can get shoping terms information by visiting gallery, by telephone or by e-mail. TakoÄ‘er, galerija Makek prati modne trendove te omoguÄ‡uje iznajmljivanje umjetnina iz svoje bogate kolekcije. Informacije o uvjetima kupnje moÅ¾ete dobiti posjetom galeriji, putem telefona i elektronskom poÅ¡tom. ------------------------------------------------------------------------------------------------------------------------------------------------------------------------------ Makek gallery was founded in 2006. in Zagreb (Croatia). It is situated in an attractive location in the area called Lenucije's horseshoe, on Zrinjevac, where the leading cultural and artistic institutions found their habitus: the Archaeological Museum, Strossmayer's gallery, Gallery of Modern Art, Art Pavilion, ... Gallery Makek containis the impressive number of works of art - paintings, drawings, prints, art photography and sculpture by renowned, mostly academicly educated Croatian and European artists. One of the important activities of the organization Gallery Makek is painting gatherings, which are held on the island Rab called the Art Colony Paradiso. Also, gallery Makek follows fashion trends, and provides rent from its extensive art collection. Information on the conditions of purchase are available by visiting the gallery, by phone and email.